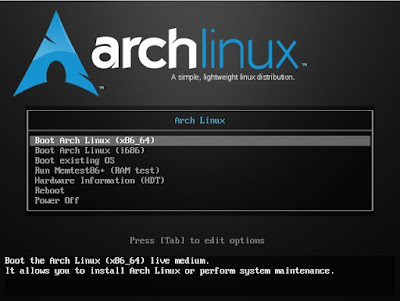 (If you have not installed and configured Arch linux yet, please check my previous post first) . A specific way in which files are stored on a disk is called file system: enables files to have names and attributes. 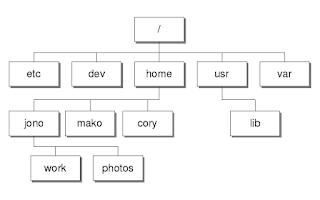 It also enables them to be stored in a hierarchy of directories or folders arranged in a directory tree. 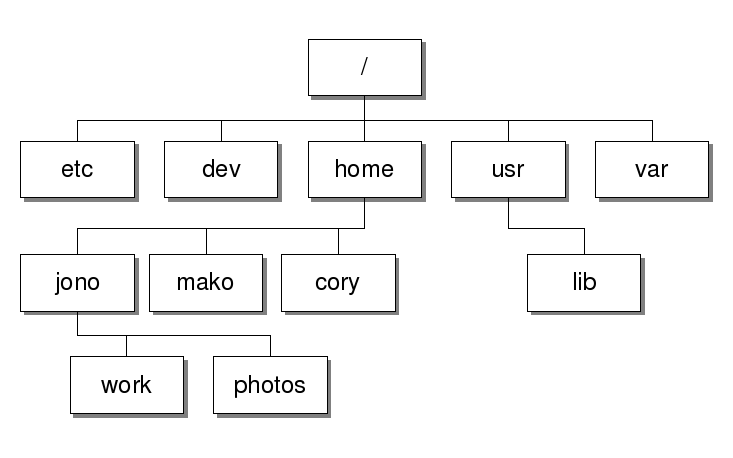 The next figure shows how does linux organizes its directories. In linux everything is a file so there is no root directory (you won't find things like c: d: etc like in microsoft windows to represent storage devices and hard drive partitions). Linux VFS (virtual file system) makes all the files on all the devices appear to exist in a single hierarchy. Linux assigns a device name to each device but that is not how the files on that device are being accessed. to gain access to files on another device, the OS must first be informed where in the directory tree these files should appear (This process is called mounting a file system). The file system (device) includes a directory that is passed to the OS to be mounted (mount point). In part01 we learned about fstab configuration file provided by linux to facilitate mounting at boot time. *Note: in the figure, jono, mako and cory are users of the systems. - core: Packages needed to, boot Arch linux, connect to the internet, building packages, and system setup processes. Pacman is one of the major distinguishing features of Arch Linux and handles installation, upgrade, removal and downgrade of packages. It features an automatic dependencies resolution. pacman keeps the system up to date by synchronizing package lists with the master server. - Install package/packages: pacman -S package1 package2 ..
- Remove a package/packages: pacman -R package1 package2 ..
More info and options: pacman ! In the next few posts, i will be introducing you and myself to the Arch linux (using command line interface only) and will try to make it a very compact tutorial that concentrates on the basics... however ..
Linux is a beloved open-source OS that competes with both market monsters, Microsoft and Apple. There are 2 ways to operate a Linux OS; using a graphical user interface GUI (windows, icons, menus, etc ... the stuff you are familiar with in windows or osx) or using a command line interface CLI (shell). Due to its flexibility and configurability, linux variants include thousands of programs and applications and they are known as Distributions or distro (like Debian, Fedora, Ubuntu, ..etc ) to satisfy all kinds of needs and tastes. Arch linux is one of these distributions (targets advanced users) that supports community involvement and consists predominantly of free and open-source software, and supports IA-32 and x86-64 architectures. Under Windows: Use a programs like Rufus to create a bootable USB drives (Rufus has an easy and multilingual interface, please check their website for details). - Finally: diskutil eject /dev/disk# before physical removal of USB key from computer. After booting the target computer from the USB key, you are automatically logged in as root. 2- Now it's time to partition and format the hard drive and we do that using fdisk and/or cfdisk partitioning tools: fdisk -l to list all available storage devices, then: cfdisk /dev/sda to use the partition tool. I suggest that you delete all partitions on the target drive (To delete an existing partition, highlight it with the up and down keys, select the Delete command with the left and right arrow keys, and press Enter) then create a root partition (by selecting the new command.This partition will include most of the disk freespace) and make it of type bootable (by selecting the type command, and using the space bar to toggle between different types). Now create a second partition (a swap partition with 1/2 the size of installed RAM on the PC) and make it of type swap. Finally save/write (write command) and quit fdisk tool. 5- Type pcstrap -i /mnt base base-devel to instal arch linux base system and development base system a on the mounted root partition. *sda1 stands for root partition and sda2 for swap partition. *The root partition is the disk partition that contains the root file system and on which the root directory is located. *Swap space in Linux is used if the system needs more memory resources and the RAM is full, inactive pages in memory are moved to the swap space. - Create a password for the root account by typing: passwd then the actual password after being prompted to do so. locale in arch linux refere to regional monetary values, time and date formats and other regional standards. - To setup the system locale, type: nano /etc/locale.gen (nano is the name of the text editor tool we use to edit the locale.gen file). - Uncomment the line referring to your region or country then use CTRL + o to save/write changes, press Enter then CTRL + x to quit. - Type : cd /usr/share/zoneinfo to navigate to the time zone settings. Type ls to list the different time zones. Here we need to have a wired internet connection (Ethernet cable) to our target computer. Check internet connectivity by pinging google.com for example..
- Now generate the so called INIT files (Initialization files used by grub to load linux). - Exit the current root session. - Here are some more keyboard settings. Finally secure the new account with a password: type passwd then create the actual password. Now we are ready to start -linuxing- !